Last Man Standing is a jump the sweeping arm game for up to eight players at a time. The speed and direction of the sweeper arm is controlled by a pedal powered mechanism in the centre of the game. This can be pedalled by one of the waiting players or by a member of our staff. The faster you pedal the faster the arm rotates. Pedal forwards and the arm rotates clockwise or quickly switch to back pedalling and it will change to anti-clockwise. Last Man Standing is an awesome multi player game for any fun day or team building event. The moment we saw it at its trade show debut we immediately placed our order and now we've also added a new twin-armed motorised version - see a little further down the page. A friendly member of our staff is provided to supervise the use of the game and they'll also provide the pedal power if required. The game is suitable for use by ages 7 - adult. It needs an overall operating space of at least 35x35ft. Our second Last Man Standing game is motorised version with both duck and jump arms. 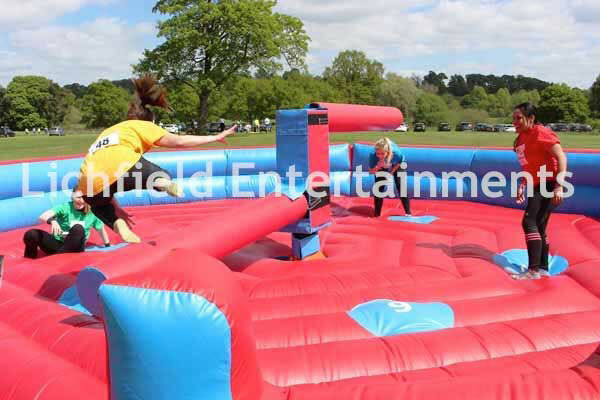 This version of the game is for up to 6 players at a time, is powered by electric motor the speed and direction of which is controlled by our trained operator, and features twin arms - one to jump over and one to duck under! If you have any queries, questions or would like to book Last Man Standing, for your event then please click here to enquire and we will do all we can to help. 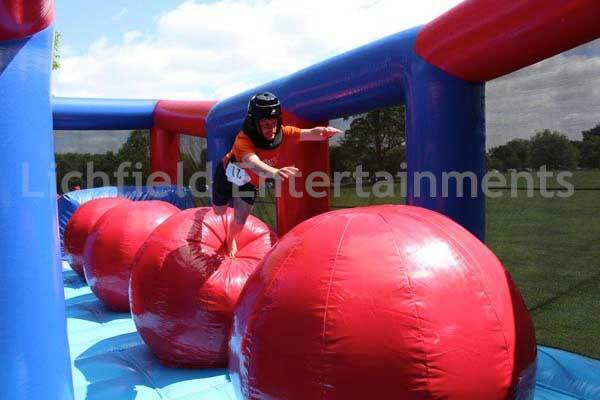 Our Jumping Balls is the ultimate challenge of balance as you have to leap from the inflatable platform onto the first ball, then on to the second, third, and fourth giant inflatable balls before hopefully making it all the way across to the finishing platform at the other side. The Jumping Balls challenge works brilliantly when hired together with the Last Man Standing sweeper arm. 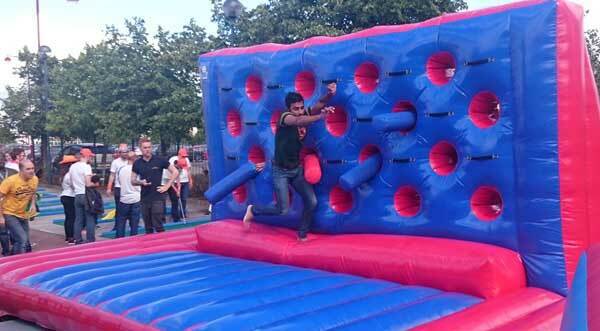 Why not also look at adding an Inflatable Assault Course and maybe the Unclimbable Ladders game. 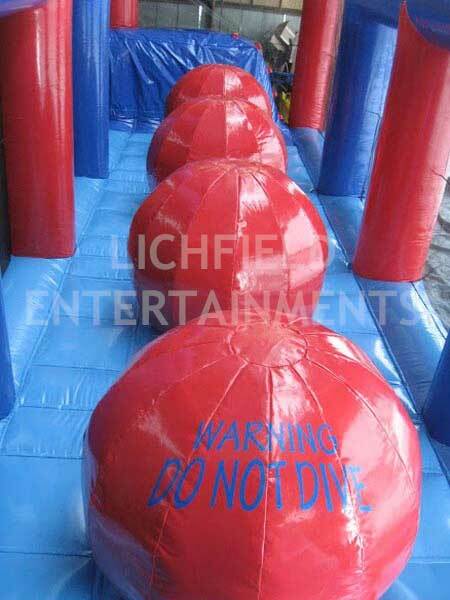 Our Sucker Punch Challenge is the most recent addition to our Last Man Standing range and involves participants having to edge their way across the inflatable ledge without getting knocked off by the boxing gloves that strike out from inside the wall. This game takes 7 participants at a time - one trying to the cross the ledge and six behind the wall trying to knock them off the ledge. 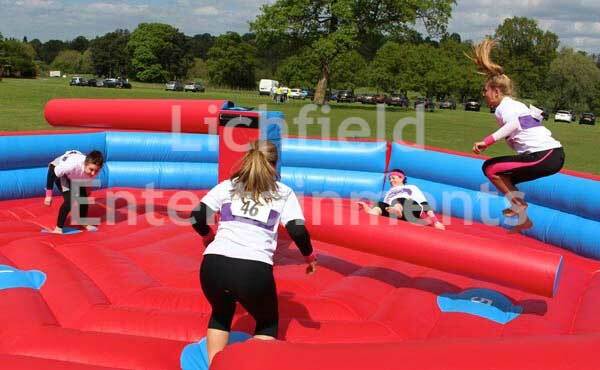 If you have any queries, questions or would like to book the games for your event then please click here to enquire and we will do all we can to help.